Art is certainly the mood changer not only for history but it wrings out truths no one wants to admit and wakes up the sleeping mind so easily locked in to monotony. This fourth day into my adventure in volatile China was a walk on the wild side of art, visiting museums and galleries where great things are changing the face of modern China. Artists are not afraid to attack their own beliefs and beings, asking "Who am I?" and "What do I do what I do?" We all skip and jump in impossible directions trying to figure out the meaning of existence and what happens when we become ashes and no longer count on faith/belief to guarantee us something more after death. Artists are also the critics of our foolishness, digging up sores and errors within ourselves and society, that need to be faced and re-faced until we get it right. In contemporary art history, Marcel Duchamp forced us to re-think the meanings, values and possibilities of objects, the purpose of museums, how far one can go in putting meaning into something as urbane as an urinal. or a bicycle wheel. Andy Warhol played with Americanisms like celebrities and Campbell soup cans and bottles of Coke Cola - and turned them into objects that today can bring millions of dollars in an auction. Why? Warhol, whom I interviewed a couple times as art editor for the Memphis newspaper in the '70ties, turned a new corner in looking at objects. He commented, "What's great about this country (US), is that America started the tradition where the richest consumers buy essentially the same thing as the poorest." He pointed to a Coke Cola in a can. "A Coke is a Coke. No amount of money can get you a better Coke than the one the bum on the corner is drinking." Is this democracy? In 1978 the Coke-Cola was what kicked down the door of US-China economical relationships - it was the first American firm to enter the Chinese market (Communist), and now China is probably its largest consumer. In our country, who fails to know a Coke logo? So Warhol put it on a pedestal, common as it is, for a reason. Trying to hit the major art spots in Shanghai is not an easy task. They are either on one side of the river or the other, and that means hours bogged down in heavy traffic that rarely lightens up, crossing suspension bridges, and then arriving at a museum or private gallery only to find out, it is closed, or opening later, or is in repair. But if one can get in the door, there is a whole crazy awakening to be experienced. 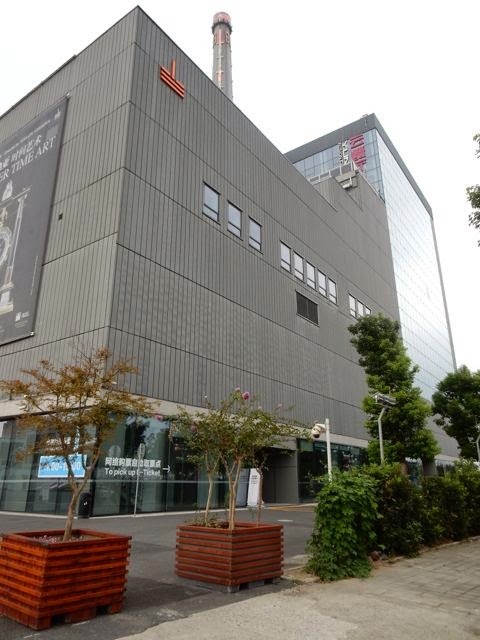 We actually started in the enormous Long Museum, founded by Liu Yiqian and his wife Wang Wei, which is in two locations - one on the Pudong side of the River and the other on the Bund side. We went to the Pudong site which was an amazing collection of traditional old Chinese ink drawings (landscapes, horses, tiny people, tigers, and calligraphy in bland colors beautifully, peacefully executed), but also an extensive survey of "red classics", or propaganda art created along party lines during the great revolution. The skills of the artists rank among the best of realists and figurative art happening at the same time in the US the early part of the 19th century. 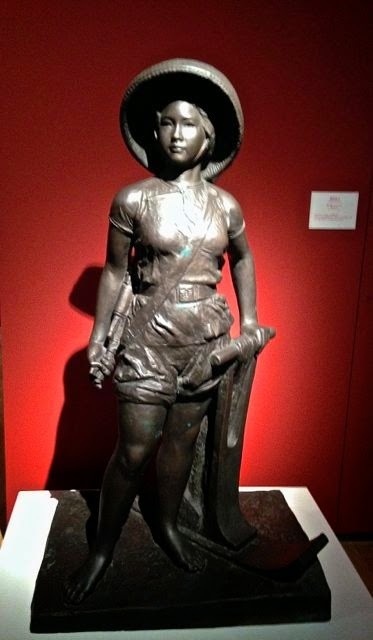 The Revolutionary art exhibition honored the 65th Anniversary of the founding of the People's Republic of China. 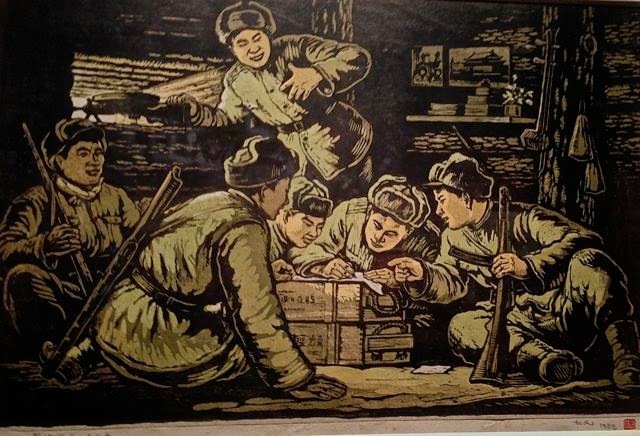 Most of the pieces, from large oils to woodcuts, were propaganda efforts to put Chairman Mao in a healthy and friendly light, hiding what was really happening behind the scenes and urging on the nation to keep building and trying and honoring the party line. The subjects are fascinating - so many women are displayed in work clothes, lifting the hoe and leading the smiling troops and children in hard work to build their nation into a power force. Colors are usually cheerful but red is dominant usually and Mao is always smiling, depicted often taller than everybody else, although he was of normal height. The Chairman looked like a "good guy, one of the gang", even though thousands of those who didn't buy his plan were being removed from life, and the revolution was falling into disarray. 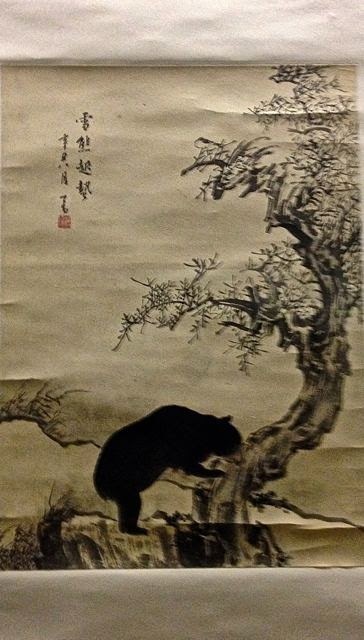 Of course, this is the point of propaganda, but the artists like Jin Shangyi, Chen Yanning, Chen Yifei, were skilled at their work, which today has brought huge prices in auction houses. It is rare to find so much propaganda art in a single collection. A brilliant independent art journalist, Xing Yu Chen, accompanied us through the many waves of history. 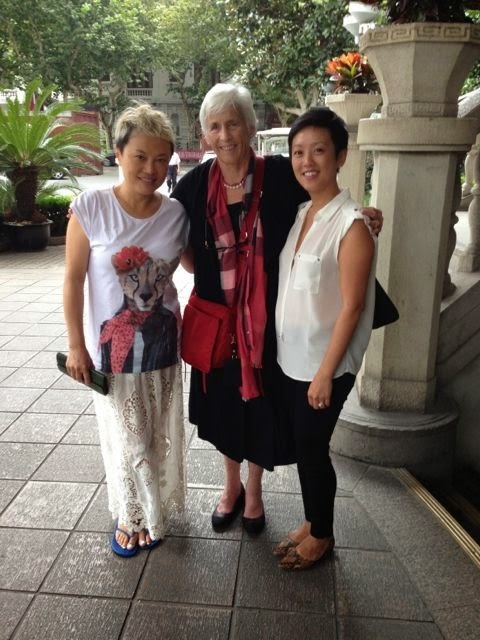 She joined us in time to re-connect with Han Feng, the fashion designer, and to have lunch at the hotel where Nixon stayed when he first visited China and started the relationship that brought the pingpong team to my home. Meals are huge, delicate but healthy (I've eaten lots of greens and fish) and today we had a tasty dessert of black sesame seed puffs (like balls) resting on tiny tiny cups containing mango juice to drink along with. It was such a fabulous atmosphere building new friends and talking about art. Haven't done that in a long time. We took off across town to the amazing Power Station of Art. 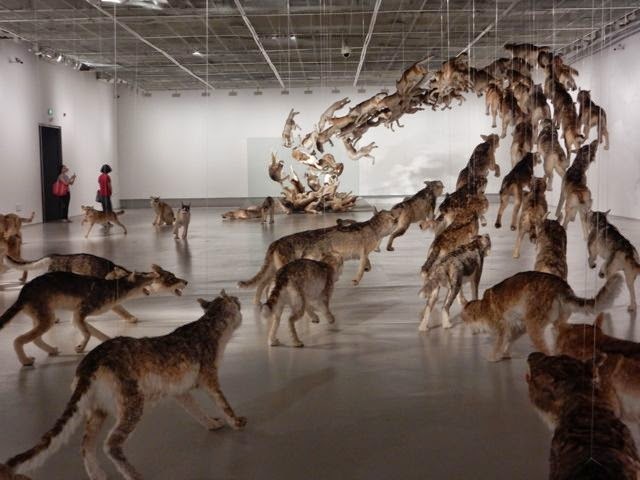 Not only is it an extraordinary facility with enormous space to house the works of artists who think enormous, but the current show was installed by probably one of the two greatest contemporary artist in China and world-wide, Cai Guo-Qiang (the other being Ai Weiwei who is in Beijing). My mouth dropped open when I entered, not only because of the hugeness of the space (we don't seem to have anything like this in the US), but the overwhelming impact of this man's work. He had been a performance artist and photographer in the original days of the post Revolutionary artists. Now he is known not only as the man who created all the pyrotechnics (fireworks and fire dances) at the Beijing Summer Olympics, but he squeezes your gut into your heart. 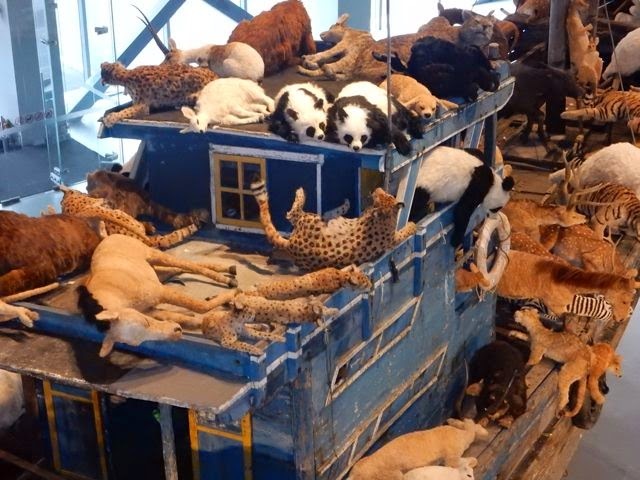 Walk into the Power Station and there is a crude worn true-size ship (an ark, Noah style) packed with life-size dead stuffed animals (crude taxidermist work), leaning, falling, standing, upended, every kind of disastrous position. This ship actually sailed from his home town of Quanzhou. 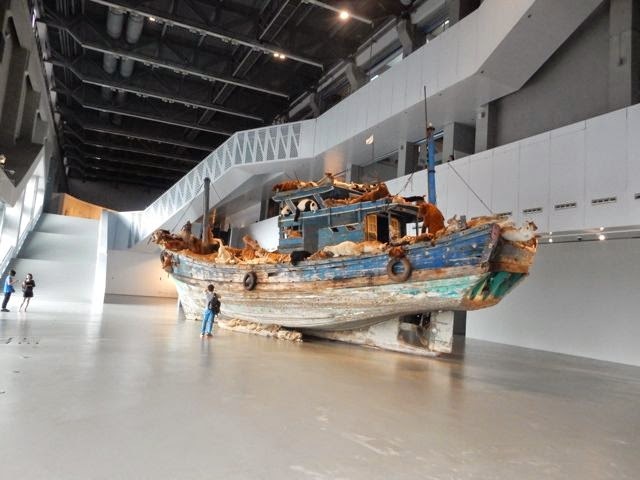 It is called the "Ninth Wave"
Cai's work expresses his concern for the earth's current environmental and ecological crisis in every installation he does. He deals with the desire of mankind to return to a primordial landscape and spiritual home. 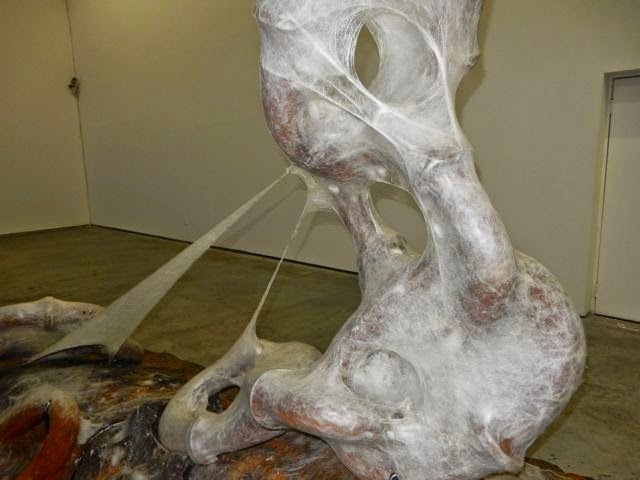 He works with a staff of hundreds to complete his installations. And as we passed the ship, a sudden tar-like odor began to surround us. 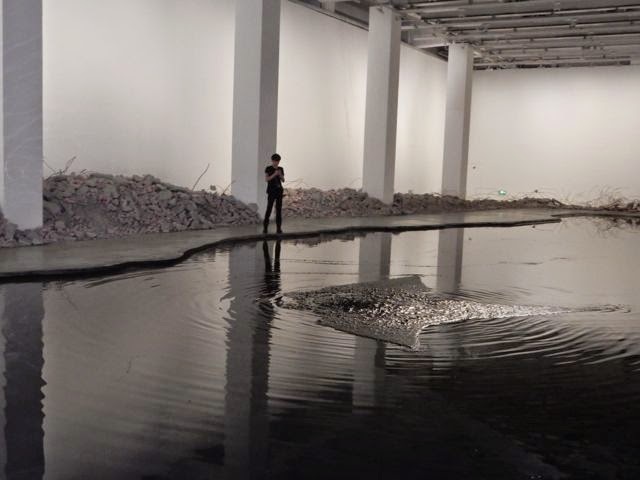 We walked down a long long empty hall to another huge space where the artist had torn up the concrete floor (at least the size of a football field), and built a pond of black ink, with spouts of the stuff shooting down from the ceiling. The odor of carbon was nauseating but one is seduced to walk around this curved pond where the removed concrete and wires pushed to the side became a landscape surrounding it. (I asked if he'd have to re-do the floor when the exhibit ended. No one knew. ) 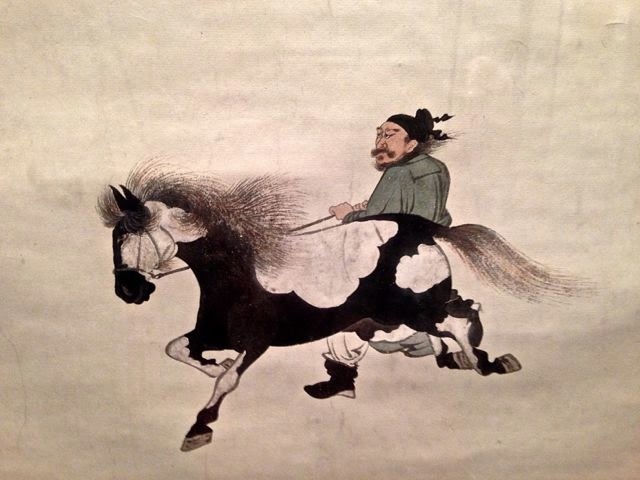 This is Cai's pointing to the black China ink used forever to create artisans art, and which is still used today, in contract to say India ink. I was anxious to get away from the odor, but I couldn't not participate in the act of walking around this huge installation. Cai's real genius is in his giant gun powder drawings. He spreads out paper or porcelain or whatever fabric on the floor, then dusts gunpowder where he wants it, around his drawings and placements, then steps away (these are HUGE pieces of paper and canvas) and lights the stuff with a match, and the fireworks begin, making holes and dark brown and black images throughout the works. (Documentaries play on the walls to show the drama of explosions on the canvases. 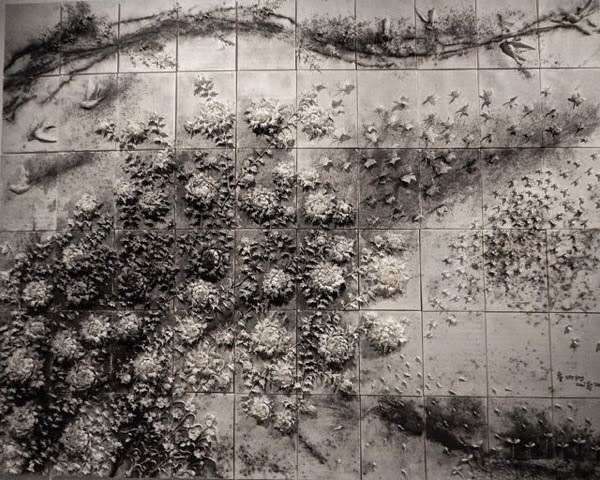 They are called drawings, but they are as stimulating and awe-inspiring as his work at the Beijing Olympics. The porcelain pieces with three-dimensional sculptures of peonies, bees, butterflies, tadpoles, and all sorts of images from nature, are the hardest to imagine - because the fire from the gunpowder actually melts and distorts it without destroying the porcelain. I have never been so moved or impressed by such installations. Chinese artists are way ahead of anything coming out of the Western world. Maybe they will "light a fire" under the rest of the art world to not be so much about their own egos, but about pointing out the discrepancies and disasters on this world. We hardly made it to the famous M 50 district, originally a warehouse along Suzhou Creek, that is a conglomeration of galleries - a few with really good art, and many with not so good. I was able to stop in one gallery where Liang Shaoji was setting up his new installation, most of it still in crates. But I got a glimpse of the incredible technique where he has "forced" silkworms (enticing them with food and light) to wrap their netting around things normally found on a wharf. He is expressing how all silkworms give life and can be the basis of enormous industries - the silk one, which at one point was what stirred the opium trade. I was amazed and wish I could see the final product. We hardly had time to turn around to make it to "ERA", the acrobatic show of the Shanghai Acrobatics Troupe, considered the best in China. It was the usual amazing and fearless attempt to keep the audience on the edges of their seats, but I was so tired I kept dozing off. It didn't have much on America's Got Talent. Young, YOUNG, girls and boys twisted and distorted their bodies in balance, men leaped through rings like daring dogs, the giant metal circles which turn as the larger circle turns and the guys do death-defying leaps and flips, a metal cage with at one point 8 motorcyclists whizzing around and a minor attempt at aerial dance routine. There was a lot of "Hay" and hands up for applause. 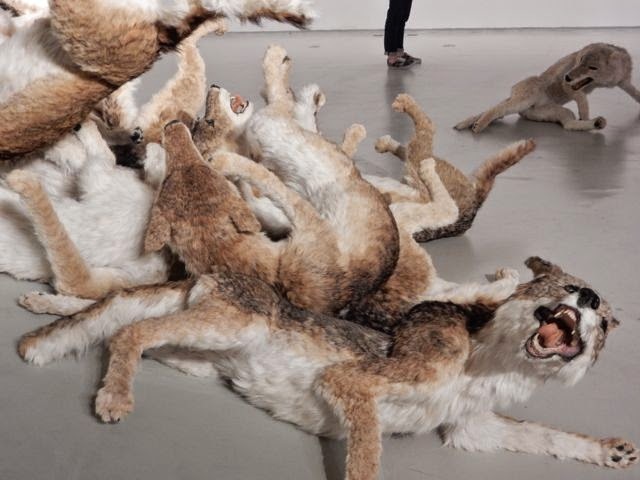 It paled in comparison to the emotional adventure I had experienced encountering Chinese contemporary artist.